Gavin Lachlan was the unlikely match winner for Cumbernauld Colts as they began 2018 with a 2-1 win over Edinburgh University at Broadwood. Sean Brown set Colts on their way to victory with the opener before Lachlan doubled their advantage after the interval. Jack Guthrie pulled one back for the Edinburgh side, but Colts deservedly took maximum points with the only down side being the scoreline should have been more convincing. And influential midfielder Lachlan could have capped a fine individual display with a hat-trick had he taken two gilt edged chances in the second half. Colts almost opened the scoring in six minutes when Lachlan delivered a dangerous free-kick into the box and skipper Greg Pascazio flicked a header against the post with visiting keeper Mark Tait rooted to the spot. 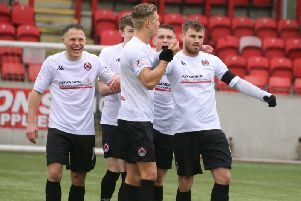 The Broadwood side were dictating the earlier exchanges and went close again in 20 minutes when Lachlan whipped in another dangerous free kick which was met by Stephen Kerr but the defender headed narrowly over the bar. Lachlan’s set piece deliveries were causing the visitors all sorts of problems and on the half hour mark Stephen O’Neill almost turned a Lachlan corner into the net, but the winger’s effort went agonisingly past the post. The Cumbernauld men continued to pile on the pressure with Brown, Lachlan and Craig Holmes all passing up good scoring opportunities but Colts eventually got the breakthrough their play deserved a minute before the break. O’Neill found Brown inside the six yard box with a clever chipped cross and the big striker made no mistake this time by coolly placing the ball into the corner of the net beyond Tait. Colts began the second period where they had left off and Lachlan got onto to the end of a dangerous low cross from Holmes in 56 minutes to double the Colts advantage, although Tait was unlucky not to prevent the ball crossing the line. Lachlan in fact had an easier chance to double Colts advantage a few minutes earlier but his point blank effort was superbly blocked by Tait when the midfielder should have scored. And then Lachlan really should have made it three for Colts on the hour mark when O’Neill found him inside the six yard box, but Lachlan volleyed over the bar when the Colts faithful were expecting the net to bulge. However Edinburgh University began to play their way back the game and danger man Guthrie went close on a few occasions with the closest effort being a header against the bar with Colts keeper Max Currie stranded. And Guthrie was rewarded for his persistence with only two minutes remaining when Max Condie broke into the box and cut the ball back before Guthrie angled a low shot past Currie from 12 yards. But it was too little too late for the visitors and Colts held out for the three points which keeps them in the top five of the Lowland League table. Colts will now look forward to three consecutive away league fixtures against Stirling University, Whitehill Welfare and Selkirk.